As a born-and-raised Idaho girl, I often find myself persuading others that Idaho has so much more to offer than potatoes and Napoleon Dynamite—incredible nooks and breathtaking crannies that will leave you already planning a return trip. One of those incredible nooks, nestled in lush northern Idaho, is Coeur d’Alene. If you live in Idaho, shame on you if you’ve never been. And if you live anywhere in the Pacific Northwest, Coeur d’Alene Idaho is a must on your travel bucket list. The rest of you who are looking for a gorgeous lake vacation with rolling hills covered with aromatic pine trees, Coeur d’Alene, Idaho is only a plane ride to Spokane, Washington then a quick drive away. You’ll join a list of celebrities (like Oprah Winfrey and Lance Armstrong) who frequently make Coeur d’Alene Idaho a vacation destination. 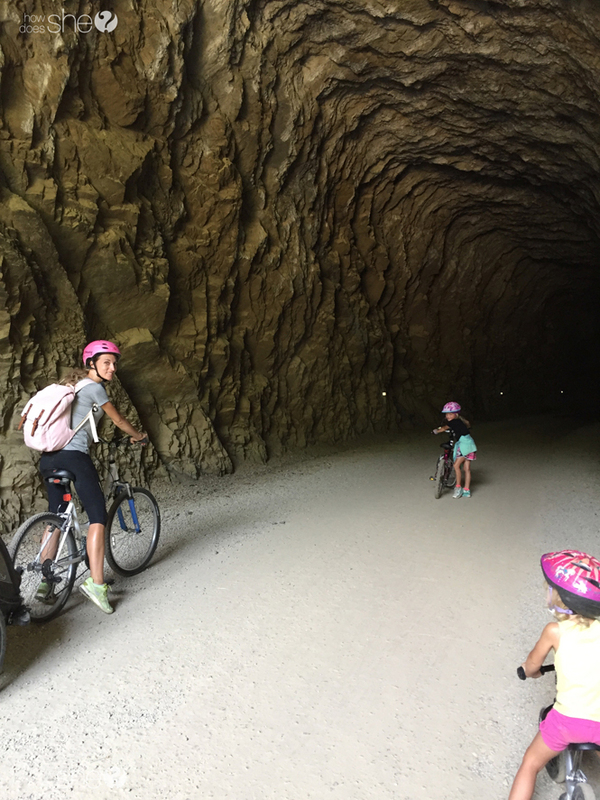 If you’re looking for an incredible family trip or couple’s retreat, here are the BEST things to do in Coeur d’Alene Idaho. Coeur d’Alene is a vacation destination so there are plenty of places to stay. We like to find a VRBO that feels more like home. 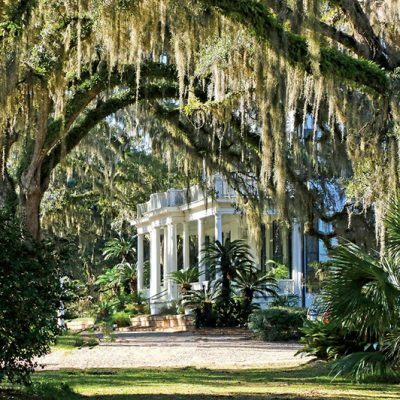 Ideally, I’d spend at least five days there because there is just so much to do. It’s nice to have a place with a kitchen where you can come home and rest your feet after a busy day. There are plenty of hotels and resorts as well. The city of Coeur d’Alene boasts two of the very best parks I’ve ever been to. 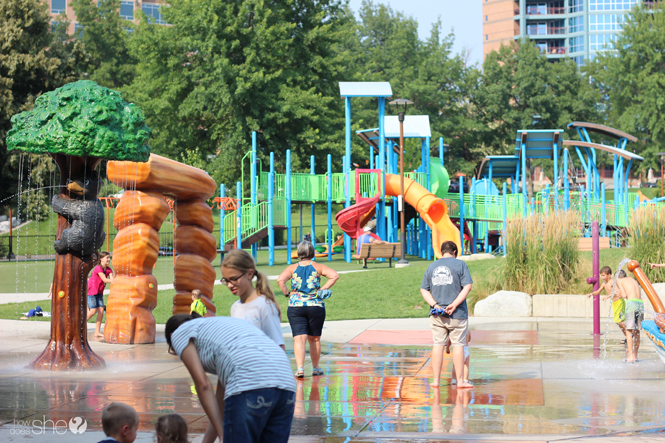 The first is City Park with the unbelievable Fort Sherman Playground. This lakeside park is literally shoulder to shoulder with Lake Coeur d’Alene. 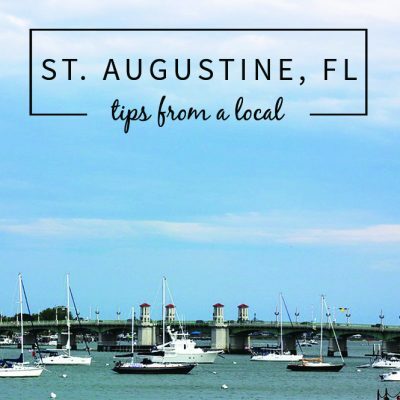 It’s got a bandshell where you’ll hear live music, outdoor basketball courts for playing some hoops, and Fort Sherman Playground, a labyrinth of wooden bridges, monkey bars, and mini turrets that kept my kids occupied for three hours! It is literally a kid’s dream. As if one amazing park wasn’t enough, Coeur d’Alene is also home to McEuen Park. You could easily spend an entire day here. McEuen Park has a huge and unique splash pad, the largest playground in the city with new amenities, tennis courts, basketball courts, and the trail head for Tubb’s Hill. When you get hungry, just tread a few steps to nearby restaurants and shops all within walking distance. You guys. Tubb’s Hill in Coeur d’Alene awakened all of the things I loved as a kid growing up in Idaho. The serenity of being in nature, the thrill of jumping off massive cliffs into the clear water below, and the cool and utter calmness of being on the water. Tubb’s Hill is a 138 mountain peninsula and the crown jewel of Coeur d’Alene. From the trail head in McEuen Park, you can hike the perimeter of the “hill” which is 2.2 miles and family friendly. We took our kids ages 2, 4, 6, and 8 (with a hiking backpack for our two-year-old) and they did great! Pack snacks, waters, and your swimsuits because there are beaches to enjoy and my favorite—cliffs to jump off! 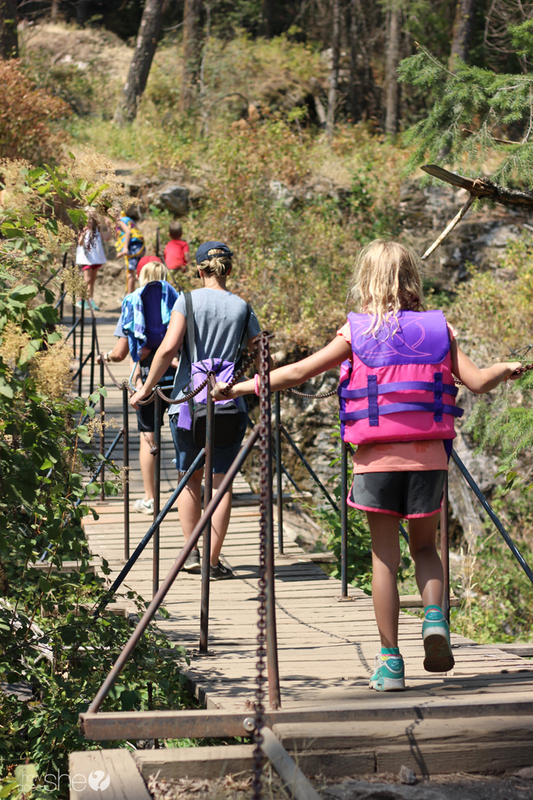 Also, make sure you cross the suspension bridge about halfway through the hike. There are massive cliffs for teens and adults and smaller ones that are kid-appropriate. I grew up cliff jumping and bridge jumping as a teen, so cliff jumping from Tubb’s Hill brought back a thrill I thought I’d packed away. 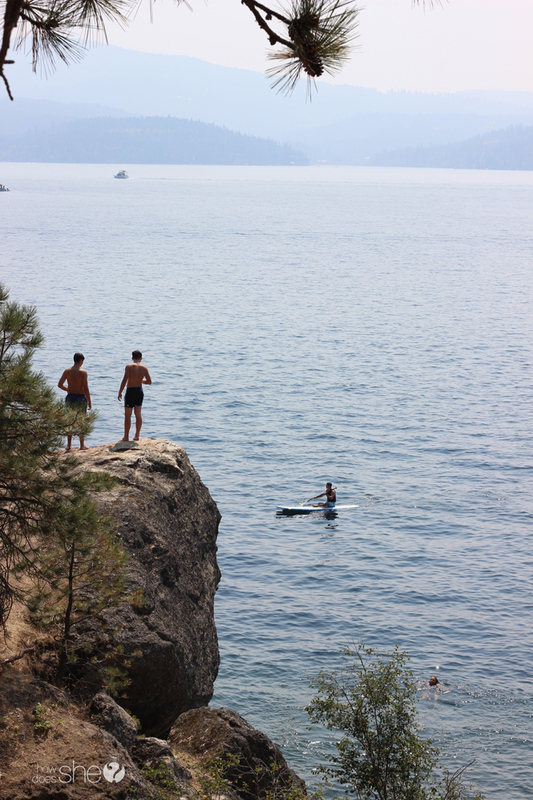 My three oldest kids had a blast jumping off of the huge boulders into the cool lake water. If you love being on the lake, you’ve come to the right place. Lake Coeur d’Alene spans 25 miles but is only one to three miles wide so you can see the beautiful shore on the other side. I’d suggest spending at lease one whole day enjoying the lake. Bring or rent paddle boards, kayaks, and inflatable toys. You can even rent boats, jet skis, even charter a sea plane. 6. Bike the incredible Hiawatha trail. If you’ve never heard of it, the Route of the Hiawatha is one of those must-see experiences of a lifetime. 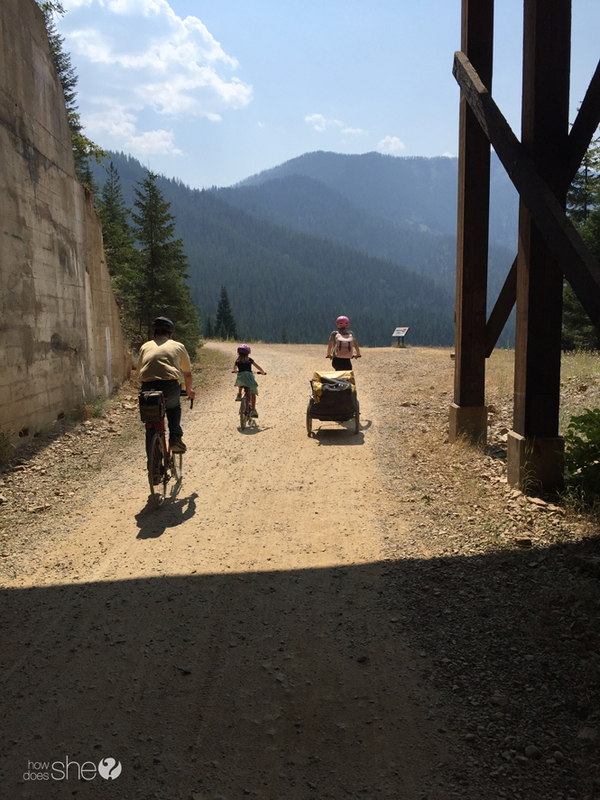 The Hiawatha Trail is a 15-mile section of abandoned railroad including 10 tunnels and 7 towering trestle bridges that the U.S. Forest Service has turned into a biking trail. Snaking through the Bitterroot Mountains right on the border of Idaho and Montana, the Hiawatha Trail has some of the most spectacular views in the world. The entire Hiawatha Trail is gradually downhill and takes about two hours to complete. If you’re biking with kids like us, expect for twice that amount of time. You’ll want a bike trailer for kids under 5 years old. I’d say ages 6 and up are good to ride the entire trail, you just may have to stop a few times along the way. 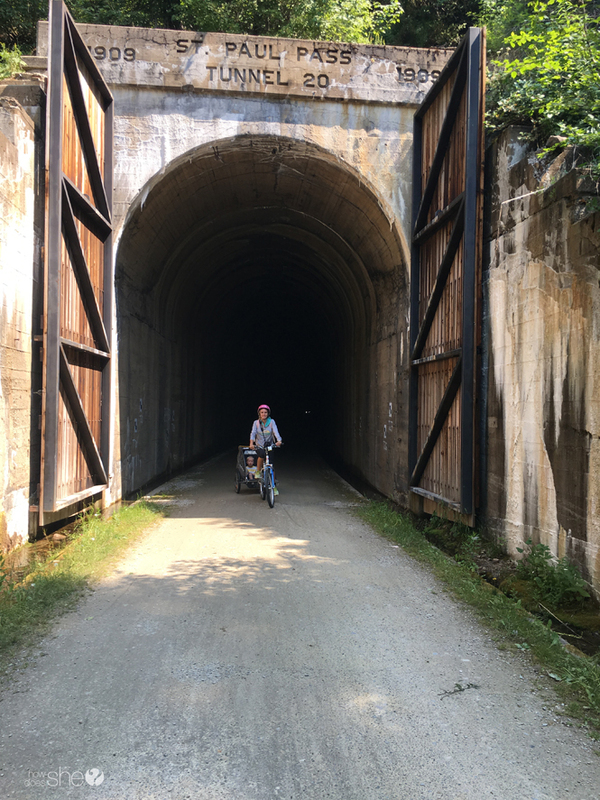 Your first date with the Hiawatha Trail is a 1.66 mile long train tunnel that is both impressive and memorable. You’ll never forget riding bikes through the pitch dark tunnel with echoes of dripping water and only the light of your head lamp to guide you. Before you go, make sure you read up on everything you need to know about the Hiawatha. 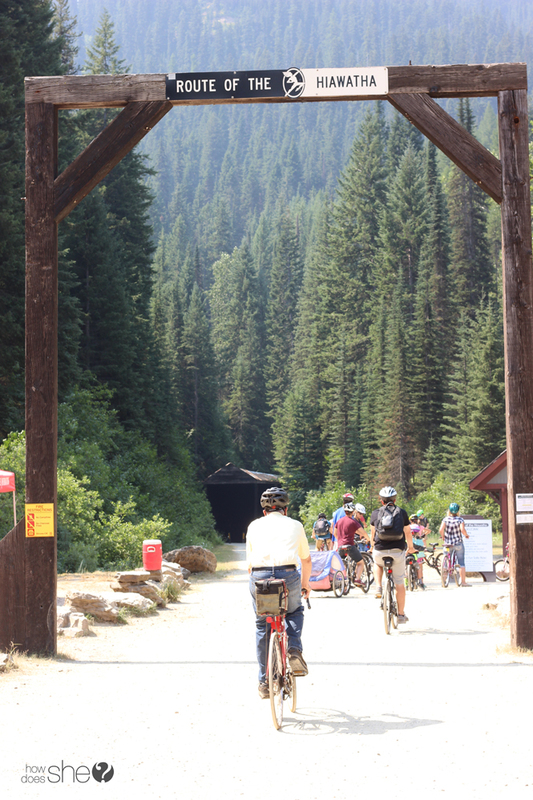 Make sure you bring: a jacket (the tunnel gets cold), plenty of water (there are a few water stations and bathrooms along the way), lunch and snacks (park your bike and have a picnic! ), a bike pump (just in case). 7. Enjoy a day at Silverwood theme park. If you get tired of nature’s entertainment, head to Silverwood Theme Park and Boulder Beach. Roller coasters, bumper boats and so much more—you kids will have a blast spending a day here! 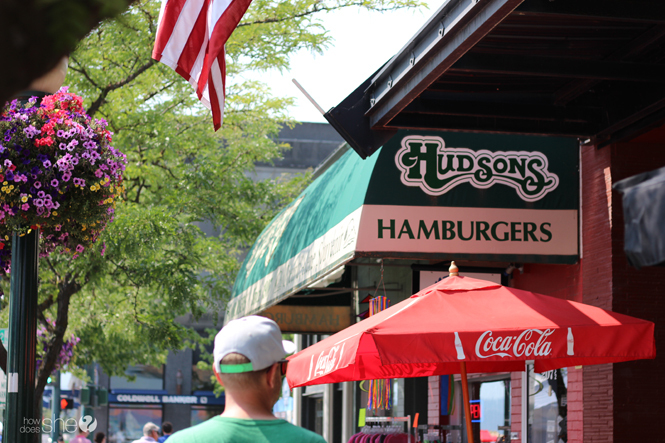 Hudsons Hamburgers– Iconic and famous with celebs and locals alike, Hudsons has been serving up no-frills, down-home good burgers since 1907. Simple then and simple now, if you’re in Coeur d’Alene, you have to stop at Hudsons. It’s practically a requirement. Fire Artisan Pizza– Pizza fans and fancy pants foodies alike will love Fire Artisan Pizza. Try the Crimini and the Camino for something different and delicious! Try the food trucks. You won’t go wrong with any of the dozens of food trucks in Coeur d’Alene. Try Meltz for gourmet grilled cheese sandwiches and RawDeadFish for the best sushi. 9. Find Mudgy and Millie. 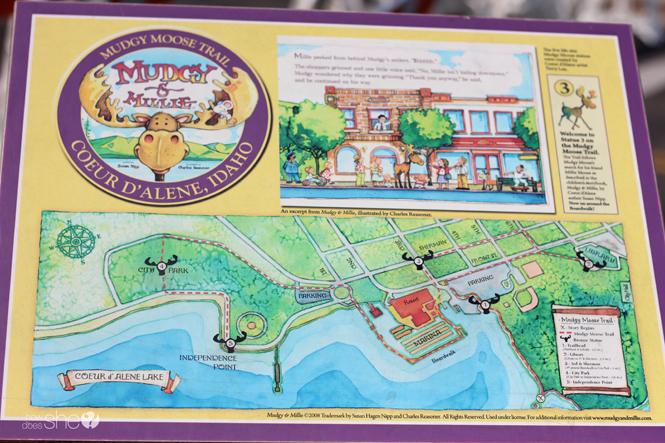 Mudgy Moose and his friend Millie Mouse are fictional characters created by best-selling author and resident of Coeur d’Alene Susan Nipp. Thanks to the Coeur d’Alene Public Library Foundation, you can find Mudgy and Millie in a real life hide-and-seek game around the city! Five life-size bronze statues are hidden around Coeur d’Alene and you can find them! Golf fans, you’re in for a treat. Coeur d’Alene is home to what Golf Digest has called America’s Most Beautiful Resort Golf Course. Waterfront tee boxes and the floating green are enough to make The Coeur d’Alene Resort Golf Course an unforgettable experience. Check out the upcoming events in Coeur d’Alene and try and catch a street fair or concert series. Make sure to visit the Downtown Farmers Market as well as Figpickels Toy Emporium and all the other shops around town. 12. Huckleberry picking and eagle watching. Last but certainly not least, pick huckleberries in the Coeur d’Alene National Forest and then come back and make your own huckleberry milkshakes. Or head to the east side of the lake for some eagle watching. So whether you’re looking for outdoor adventure, a little relaxation by the lake, or some big-time fun, Coeur d’Alene, Idaho is your place! 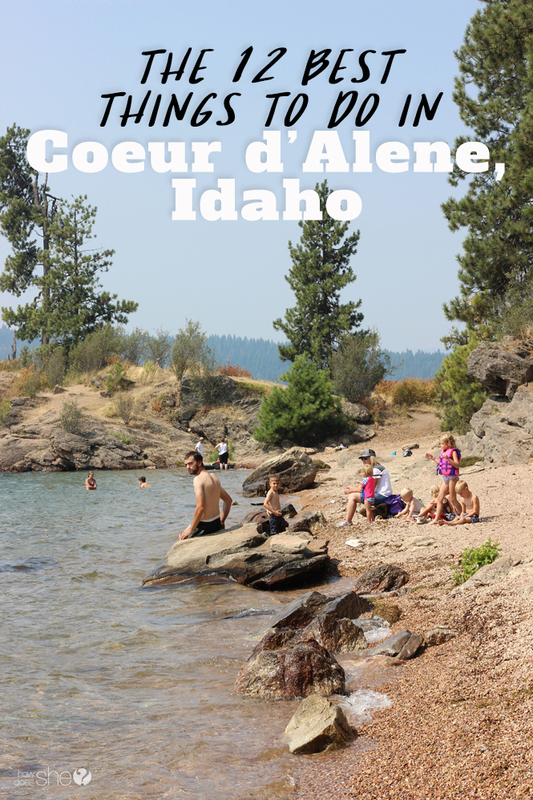 Comment below with your favorite things to do in Coeur d’Alene. I a born-and-raised Idaho girl too…loved seeing all these scenic pics that Idaho is known for. I live in downtown Coeur D Alene. Thank you for coming to enjoy and let others know how amazing this place is! Where is the little sandy beach alcove with rocks (first and last photo in the blog)? Hi Anna, that is at Tubb’s Hill. You have to hike around it, but there are several spots along the way you can pull of and take a swim. Happy travels!